1969 Truly Scrumptious doll 11 1/2"
The 1969 Mattel Truly Scrumptious doll is 11 1/2" tall - Mattel Barbie dolls friend, is an early personality doll, (Diahann Carroll as the TV character Julia is the other doll). Truly Scrumptious is based on the Chitty, Chitty, Bang-Bang movie character played by British actress, singer Sally Howes. 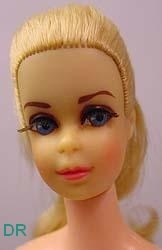 Truly Scrumptious doll uses the Francie doll head mold, with blonde hair pulled back into a ponytail, real eyelashes, blue painted eyes, closed mouth, a full figure Barbie size jointed body, so the Truly Scrumptious doll can share any of Barbie's extensive wardrobe. Non twist waist, same Francie head mold as 1107, long blonde hair no bangs, tied in a ponytail with curly ends, rooted eyelashes, blue eyes. Light pink long gown, pink over skirt netting, matching fancy hat, pale pink unmarked closed toe pilgrim shoes, clear X stand. Doll Marking: Midge ™ © 1962 Barbie ® © 1958 by Mattel, Inc Patented. 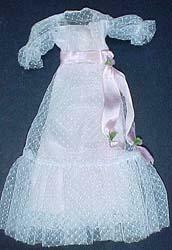 Same head mold as 1108 doll, this doll talks, has bendable legs and a deeper pink gown with black net over skirt, fancy deep pink net hat, hot pink unmarked closed toe pilgrim shoes, clear X stand. Doll Marking: © 1967 Mattel, Inc. U.S. & Foreign Pats. Pend. Mexico.